There's probably a lot you don't know about 'Donnie Darko’, starting with what the story was about. Light years ahead of anything else released at the time, the film’s alternate universes, impending apocalypse and intimations of time travel, has meant the movie's meaning is still debated over 15 years after its release. Initially, Donnie Darko was considered to be a little too weird to make it into production. If it wasn’t for Drew Barrymore, the film might not have ever been made. After meeting Director Richard Kelly on the set of Charlie's Angels she signed up to play the role of English teacher Karen Pomeroy and went on to agree to produce the film through her production company Flower Films. It was then that interest in the film began and Kelly was able to raise the funding needed to begin shooting. The time "28:06:42:12", indicating how the long the world had left in the movie, was created by adding or subtracting one from each of these numbers: 27:07:43:11, the precise length of one lunar cycle. Which, as it happens, is the exact same length of time that passes during the film's narrative (from the jet engine landing in Donnie's bedroom to the final scene, which ends the same way). But Kelly insists the 28-day theme was pure coincidence. The Director of Donnie Darko Richard Kelly grew up in Midlothian, Virginia, which was the town he referred to in the original script. This was later changed to Middlesex. The film only made back $500,000 of its $4.5million budget during its initial theatrical release back in 2001. It was only when this misunderstood sci-fi movie featuring Drew Barrymore and Patrick Swayze ran as a midnight movie (for 28 months) at the New York City's Pioneer Theater that its popularity grew. With other theatres around the country following suit, the movie went on the earn over $10 million through DVD sales. Working with a small budget, composer Michael Andrews tried (and failed) to get the rights to U2’s ‘MLK’ for the final scene in the movie. Instead, he got his friend Gary Jules to record a cover of the Tears for Fears song ‘Mad World’. It was released as a single and reached the top of the UK charts, earning the title of Christmas number one in 2003. It's not, in fact, a reference to 'Harvey,' the classic 1950 comedy where everyone thinks Jimmy Stewart is crazy for conversing with a man-sized rabbit that no one else can see. Rather, Kelly said, creepy Frank was inspired by the rabbit protagonists of Richard Adams' novel Watership Down. Kelly explained that the idea for the odd-looking 'future blobs' that he sees emerging from people’s stomachs was the result of staying up late at home, reportedly while high, watching an episode of John Madden's NFL analysis, Monday Night Football. Noting the way that Madden freeze-framed the action and drew arrows indicating where each player was about to move, Kelly conceived a more supernatural version for the film. Despite meeting with director Richard Kelly on four separate occasions to discuss playing the lead role in the film, Vaughn had some (legitimate) concerns about whether he would be able to pass for a 16-year old and eventually passed on the opportunity. Although he liked the script and the storyline, the actor, best-known for his appearances in Wes Anderson films including Rushmore and The Grand Budapest Hotel, had to pull out due to scheduling clashes, which opened the door for Jake Gyllenhaal. After securing Jake Gyllenhaal for the role, Director Richard Kelly was initially hesitant towards casting his sister Maggie for the role of Elizabeth Darko. But, after being convinced by the scene of her drinking urine in the movie Cecil B. DeMented, he quickly realised he wouldn’t have to work hard at creating a sibling rivalry on screen between the two skilled actors. Kelly got permission from Smurf’s creator Peyo to include Donnie's comments about the Smurf’s sexuality. Peyo gave the go-ahead because, as profane as Donnie's remarks are, they’re considered to be an accurate description. Well, maybe not Donnie himself, but the actor who played him is still unsure how to interpret the ending. During an interview Jake Gyllenhaal confided that he didn’t actually know what the film was about, suggesting any of the fans’ theories could be true. Originally, the film that Donnie and Gretchen watch in the cinema was intended to be Douglas Creek's 1984 sci-fi/ horror C.H.U.D., but obtaining the rights proved to be too time-consuming for the film's tight shooting schedule, so Drew Barrymore once again came to the rescue and called Sam Raimi, who owned the rights to The Evil Dead and offered to let them use footage from the film for nothing. 17. The scene with Donnie and his friends riding bikes is a tribute to E.T. Kelly deliberately included the scene as a reference to Spielberg's film, partly because E.T. is one of Kelly's favourite movies, and partly as a reference to the fact that a young Drew Barrymore, one of Donnie Darko's producers, also starred in Spielberg's film. 18. Jena Malone didn’t know how to say"Professor Kenneth Monnitoff"
The scene where Donnie corrects Gretchen was improvised because Malone could not say the name "Professor Kenneth Monnitoff" correctly. 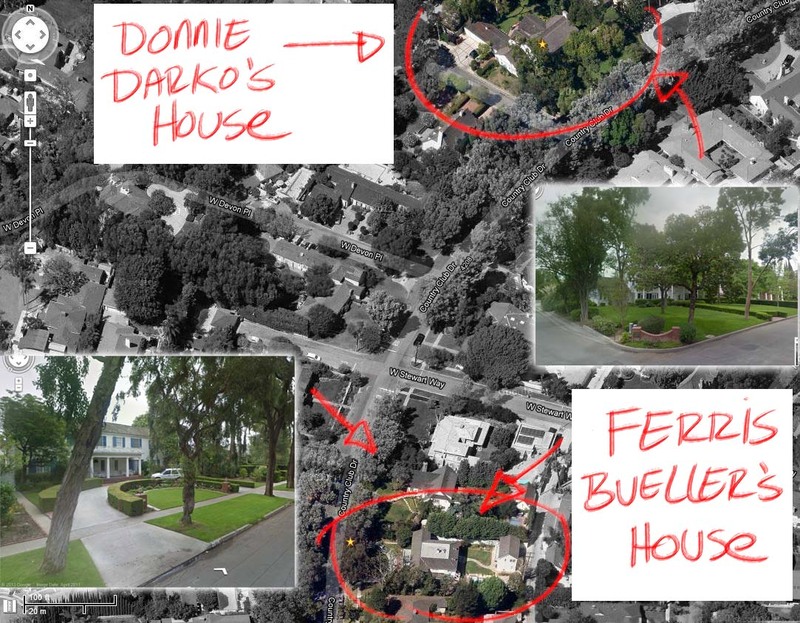 In the hit 1987 comedy “Ferris Bueller’s Day Off”, his home was filmed at 4160 Country Club Drive, Long Beach, California, just a couple of streets away from where the jet engine falls into Donnie’s bedroom. The Philosophy of Time Travel is a difficult book to read, mainly as it’s imaginary. But much of the text from the book – written by the fictional Grandma Death – is now available on the film’s website, DVD and has been incorporated into the director’s cut. Happy reading! Fancy a rewatch? You can get your copy of Donnie Darko here.